Marston Doles is a tiny hamlet and lies at the point where the Oxford Canal crosses the old Welsh Road, used by drovers to move sheep from the Welsh hills to the markets in Buckinghamshire and London, thereby managing to avoid many of the tolls exacted at the time. Napton Top Lock is to be found at Marston Doles. This is the last of the nine locks that is required to raise the boats by a total of 52 ft. from Napton Wharf and around Napton Hill to Marston Doles. Priors Hardwick was once a thriving medieval village, depopulated firstly by the plague and then by the sheep enclosures. 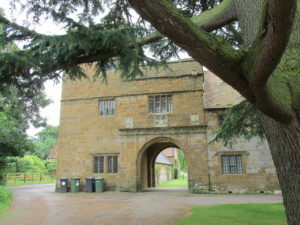 The name of the village derives from the fact that it was originally a manor belonging to the Priors of Coventry, passing after the Dissolution to the Spencer family. The proximity of the village to the Drover’s Road known as the Welsh Road has influenced the naming of parts of the village, for example Cowpool and London End. This small village occupies an elevated position along a ridge of high ground and the dominant feature of the village is the church of St. Mary. Most of the village is included in a Conservation Area. The church of St. Mary is Grade 2 Listed and this simple, but beautiful church has been used for Christian worship for over 800 years. The modern lych-gate of the church was built in 1862 to celebrate Queen Victoria’s Jubilee and its position amongst the mature trees acts as a natural focal point. 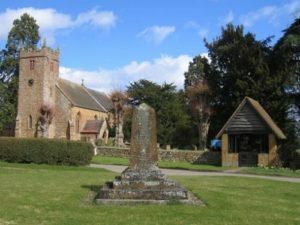 The oldest houses in the village are to be found around the well-tended village green and the war memorial. Here there are an assortment of picturesque cottages, houses and barns built with local materials, and the rust coloured Hornton ironstone abounds. Beyond The Butchers Arms, a property dated as 1562, although some sources date it as 1375, is in the part of the village known as Lower End. Here there is a more open feel to the village, with the properties like The Old Vicarage which are mostly well set back from the lanes. The major business in the village is The Butchers Arms, originally a public house, now a Portuguese restaurant. Priors Hardwick shares the modern Priors Village Hall in Priors Marston. Stoneton is a tiny hamlet and manor house and it was documented in the Doomsday Book. From the late 15th century the wealthy Spencer Family owned land here together with both the Manor House and Wormleighton Manor. Little remains of the original village which lies in a field next to the Manor House. In fact all that remains is the outline in the field and the farmer is not allowed to plough this area and uses it for grazing only. The moat has been restored to Stoneton Manor, using water supplied from a nearby spring. Wormleighton has Conservation Area status and there is definitely a degree of serenity and a feeling here that time has stood still. The parish church of St. Peter is a Grade 1 Listed Church of significant historic interest and built around 1150. Its basic simplicity adds to the overall impression of timelessness. There is a visitor’s book inside the church and it receives numerous comments from those who love its peace and tranquillity. Entrance to the church is via the North Door. The original village of Wormleighton did not actually survive the effects of the enclosures, and the mounds and hollows that remain, lie to the west of the present location. The nearby Oxford Canal was constructed in 1778. Wormleighton Manor belonged to the wealthy Spencer Family and Robert Spencer built the handsome Gatehouse in 1613, and on the south front can be seen the Royal Arms with the thistle and rose. The family abandoned Wormleighton Manor in 1645 in favour of Althrop House, after it was burned down by Royalists during the English Civil War. All that is left now is the Gatehouse and Tower Cottage, both of which are Grade 2 Listed Buildings and the northern range of the Manor. The war memorial at Wormleighton can be found alongside the footpath as you approach The Gatehouse.